LoA_Take your favorite mount in Mount Exclusive! Take your favorite Mount with you! 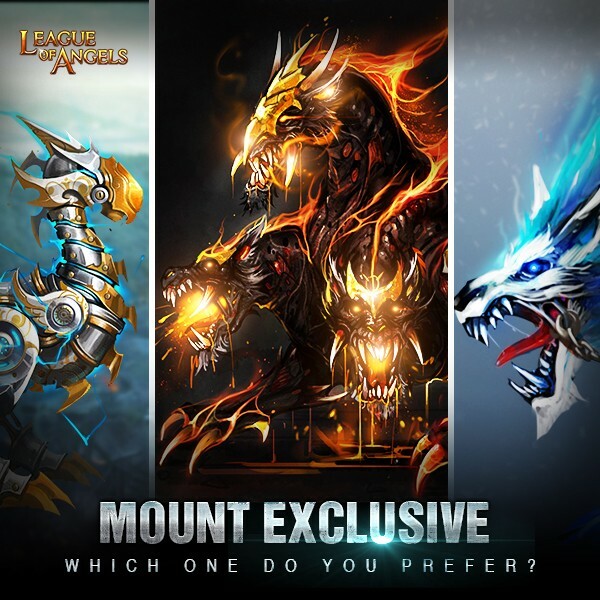 In the Mount Exclusive there are 3 Mounts, Cerberus, Azul Wulf and Iron Cockatrice awaiting for you! Which Mount do you want to join your world? Choose one mount and complete tasks, then you can take her into your team! You can only walk away with one mount in Mount Exclusive and use the Mount Bonus Card to swap an extra reward. So be careful, don’t choose a mount that you already had. - Extra refresh attempt can be obtained by using Quiz Voucher. Quiz Voucher can be purchased for Diamonds or Vouchers, or obtained from the events Total Recharge Reward, Today's Gift, Omnipotence and All-round Talent. Description: Log in every day to win Quiz Vouchers! More exciting events are coming up through September 9 to September 11, check them out in the in-game How Events menu now!